Next week, Atlanta will host the Super Bowl. This will be one of the largest sporting events in the city’s history, aside from the 1996 Olympic Games. The challenge presented by these major events remains the same: how will the Gate City treat its most vulnerable populations as we welcome the world? Today, thanks to improved immigration policy, historic bail reform and pre-arrest diversion legislation, the jail’s population hovers at under 100 people. Unfortunately, due in part to the City’s support of the forced closure of Metro Atlanta Taskforce for the Homeless’ Peachtree-Pine shelter, street homelessness increased nearly ten percent between 2017 and 2018. Partners for Home reported that in 2018, 3076 people were homeless in Atlanta, 740 of whom were unsheltered. There is no question that both the city and non-profits lack adequate bed space for the current homeless population. While the lack of available shelter space is nothing new, the City’s destruction of homeless camps, destruction of homeless individuals’ belongings, and increasing arrests and threats of arrest of individuals for urban camping and other status offenses as the Super Bowl approaches strongly suggests an intent to sanitize the image of downtown at the expense of our homeless citizens. Criminalizing homelessness and poverty violates our most basic human rights, and it sets in action a revolving door: people sent to jail for sleeping on the street and other status-based charges (trespass, soliciting money, urinating in public, etc.) are more likely to experience homelessness again once released. Performing daily, life-sustaining activities such as crossing the street, finding relief without indoor plumbing and asking passersby for money can be enough to land people behind bars for months and in extreme cases, a year or more. Law enforcement must utilize resources such as pre-arrest diversion and crisis intervention when making contact with people obviously in need of assistance. Jail administrators must adhere to the requirements outlined in bail reform legislation mandating that people arrested for most non-violent charges be released on their own recognizance. Atlanta judges must honor the constitutional mandate that they not assess bail or fines at rates accused persons cannot afford. We need your help to hold Atlanta accountable to vulnerable populations during the Super Bowl. First, we ask you to support a collaborative effort to observe municipal court proceedings January 31-February 5 at 8:00 AM. Sign up to help here. A commitment from the City of Atlanta Solicitor General to encourage pre-booking diversion for people brought to the jail for minor offenses. Sample Script: Hello, my name is [YOUR NAME] and I [LIVE/WORK/WORSHIP] in Atlanta. 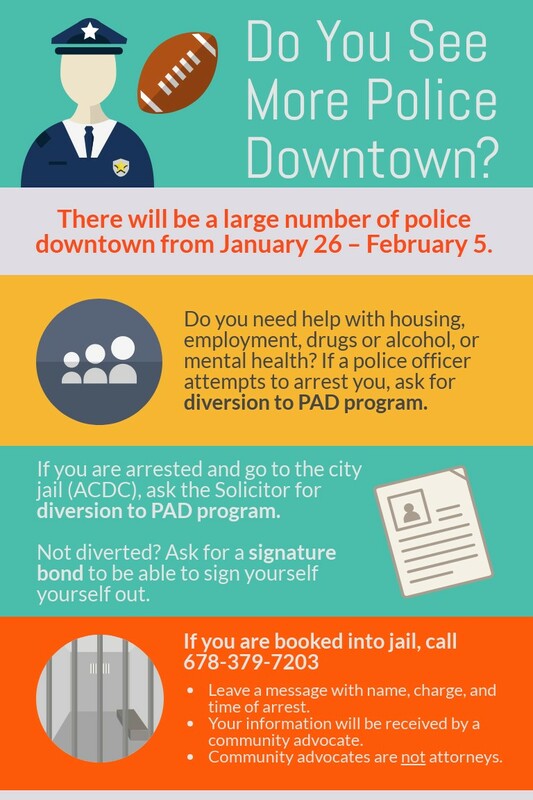 I am concerned that homeless and visibly poor people will be displaced and arrested in preparation for the Super Bowl. I am part of a larger community that supports a more humane and moral approach to the issues of poverty and homelessness and ask that instead of increasing arrests, the city (1) keep its warming shelters open for the duration of Super Bowl events; (2) encourage law enforcement officers to refer persons in need to the Pre-Arrest Diversion program or other direct service providers; (3) encourage the Atlanta Solicitor General to support pre-booking diversion; (4) require that jail administrators closely adhere to the bail reform ordinance passed unanimously by City Council in 2018; and (5) require judges to honor the Constitution by not assessing fines, fees and bail that accused people cannot afford. Thank you.